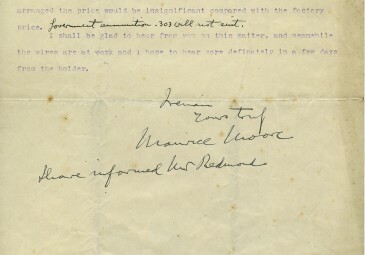 Letter from Col. Maurice Moore to ‘Lord Mayor’ [Lorcan Sherlock], 25 December 1914 (UCD Archives, IE UCDA P102/353). Part 11 of our Centenary Special. Original statement and analysis by Dr Conor Mulvagh can be viewed below and in PDF. 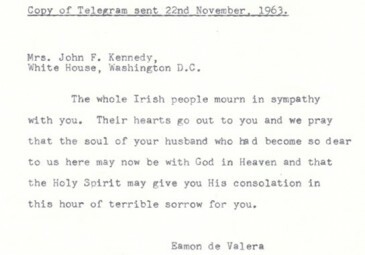 Images courtesy of UCD Archives. To round out this year’s ‘From the Archives’ series, December’s instalment finds Col. Maurice Moore of the pro-Redmond National Volunteers taking a moment after his Christmas dinner to press on with his plans to arm and equip the National Volunteers. Despite the flourishing of new historical writing coming on stream of late, significant gaps remain in the historiography of Ireland’s revolutionary decade. Although several works are in the pipeline, a definitive history of the Irish Volunteers has yet to be written. Even less well understood is the history of the majority breakaway group, the National Volunteers. Despite the fanfare with which Redmond’s September 1914 call to the Volunteers to fight overseas was received, sources from within the National Volunteers suggest that less than 1 in 6 of the 153,000 members of the force actually signed up for service with the British army up to the spring of 1917. Additionally, it seems that the force did not organise an event of national significance following Easter 1915 after which its relevance in public life petered out, leaving space for the more radical but smaller MacNeillite ‘Irish Volunteers’ to ramp up their activities and prominence. Like the organisation which he ran, Col. Maurice Moore is a figure deserving of more attention in Irish history. His story is far from straightforward. Moore had been a founding member of the Irish Volunteers and had opposed John Redmond’s hostile takeover of the movement in the summer of 1914. Nonetheless, Moore sided with Redmond in September 1914 when the majority split away from the movement’s founder, Eoin MacNeill. Moore also campaigned in defence of Roger Casement prior to the latter’s execution in August of 1916. By 1917, Moore was threatening resignation, standing in defiant opposition to Redmond in the run up to Easter 1917. Moore demanded that the National Volunteers have their convention as laid down in their constitution. However, Redmond refused, acutely aware of how such a meeting would play out in the British press on the paschal anniversary of the 1916 Rising. Maurice Moore’s military expertise was of a calibre rare in either the Irish or the Ulster Volunteers in this period. Moore had been commander of the 1st Battalion of the Connaught Rangers during the second Boer War from December 1900 to May 1902. Interestingly, imperial service in Africa appears to have had the same effect on Moore as it had on other figures such as Erskine Childers and Roger Casement. As historian Marie Coleman notes, the treatment of Boer civilians witnessed by Moore provoked in him a crisis of conscience and a growing sense of anti-imperialism. 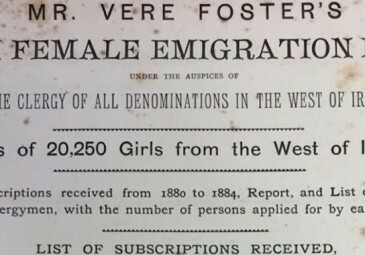 He published articles anonymously about the abuses he had witnessed in South Africa – including concentration camps – in the Freeman’s Journal before retiring from the army, aged 51, in 1906. Having begun to learn Irish while in South Africa – practicing his new linguistic skills on Irish-speaking members of the Connaught Rangers – Moore became deeply involved in the language revival when he returned to Ireland, combining cultural and political nationalism. Moore was unusual but not unique in his political trajectory after independence. He was at different times a member of Cumann na nGaedheal (1922-26), Fianna Fáil (1928-39), and the small Clann Éireann party (1926-28). He served in the Free State Senate for its entire period of existence and he was a member of Seanad Éireann from 1937 until his death days after the outbreak of the Second World War in 1939. This month’s letter resonates with much of Moore’s personality and outlook. It sees the Colonel, writing on Christmas day, trying to secure the purchase of arms for the National Volunteers. 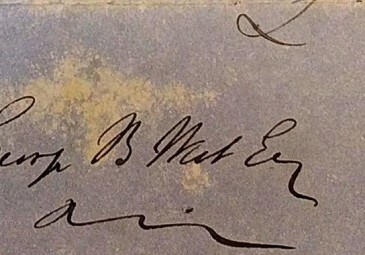 Although the identity of his correspondent is not clear from the letter, it would seem that the Lord Mayor in question is the Lord Mayor of an Irish city, most likely Dublin. If this is the case, then the person in question is Lorcan Sherlock, a Redmondite Home Ruler. This would tally, as Moore was also involved in the constituency organisation of the Home Rule movement, the United Irish League. 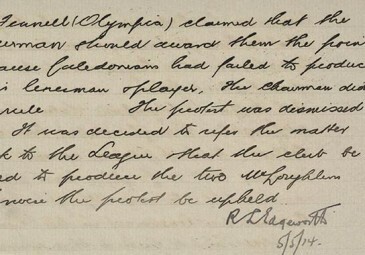 However, the real question is how this letter ended up in the papers of Michael Joseph (The) O’Rahilly. 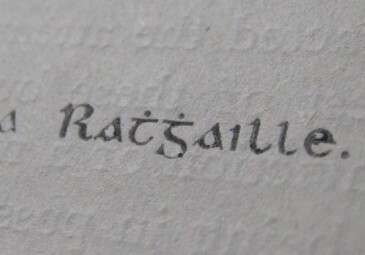 O’Rahilly was firmly in the MacNeill camp at this point in time and historian Patrick Maume notes how he had transitioned from ‘favour[ing] a coup d’état against Dublin Castle on the outbreak of the first world war’ towards a defensive strategy opposed to any pre-emptive uprising during wartime. That correspondence from a senior figure in the National Volunteers came to be in the possession of a senior Irish Volunteer like O’Rahilly suggests either cooperation or infiltration. Whichever is the case, it further justifies the need for fresh research into the history of the four paramilitary volunteer movements in Ireland (the Ulster Volunteers, the Irish Volunteers, the National Volunteers, and the Irish Citizens Army) between the outbreak of the First World War and the beginning of the 1916 Rising. 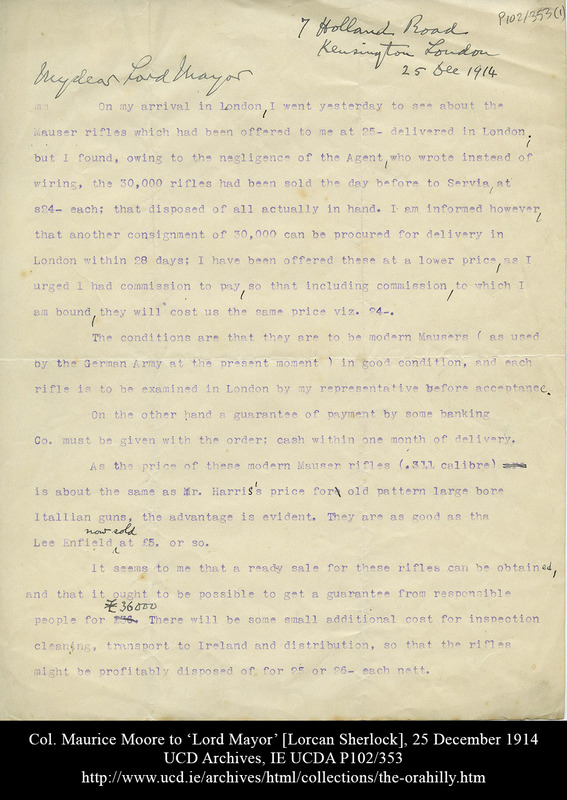 Despite the close alignment of the National Volunteer force to the British recruiting effort, this letter underlines how the National Volunteers were still pursuing an independent policy and that their leadership was keen to secure arms for the movement outside of British channels. Furthermore, it confirms that that Ireland’s obsession with the acquisition of arms did not abate following the outbreak of the war in September 1914. That the trade in captured weapons was simultaneously servicing markets in Ireland and Serbia during the winter of 1914 underlines how an excessive focus on the central zone of conflict in Northern France and Belgium can occlude the fact that peripheral regions did not diminish in their significance after Sarajevo and remained important even prior to the onset of stasis in Flanders and the opening up of new fronts in Gallipoli and Salonika. 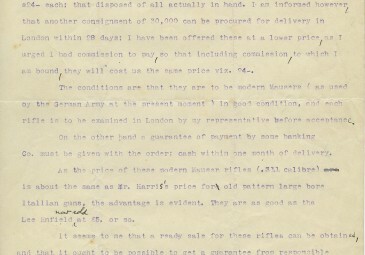 That private money was being paid to purchase captured weapons adds an interesting dimension to the story of how government and private interests interacted during the First World War. Finally, given that many historians have questioned whether Ulster and Irish Volunteers were more serious about being seen with arms than about using them, the fact that rifles are prioritised over ammunition in this document is worth noting. 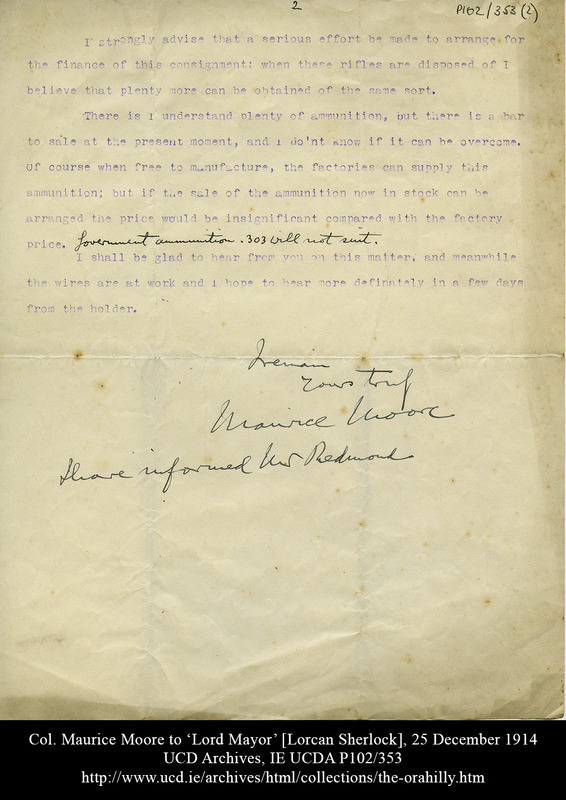 Maurice Moore’s papers can be viewed in the National Library of Ireland.